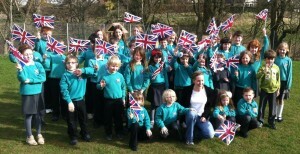 Pupils in Barthol Chapel Primary School were lucky enough to receive a visit from local Olympic swimmer Hannah Miley. Hannah was making a visit within her role of “Ambassador” with the “Wells Sports Foundation”, which aims to bring athletes to schools in order to inspire pupils to take up sport and lead healthy lives. The pupils in the small school had spent many weeks preparing for Hannah’s visit which was organised through local Active Schools Coordinator, Erica Jones. The pupils had prepared a wall display and many questions for the international swimmer. They greeted her with her favourite song and presented her with a gift of her favourite energy food and also a lucky mascot to take to the Olympics with her this summer. Hannah will compete in the 200m and 400m Individual Medley events in London 2012. Hannah spoke to the pupils about her training lifestyle and her travels and she visibly inspired the pupils, some of which swim at her local club, Garioch. All of the senior pupils took part in a 10 week swimming programme organised by Active Schools last year and hope to be attending swimming lessons again in term 4. Previous Previous post: Steak Night Every Thursday at Ythanview Methlick.